I’ve been playing around with ways to obtain schedule information for the Thames Clippers service. 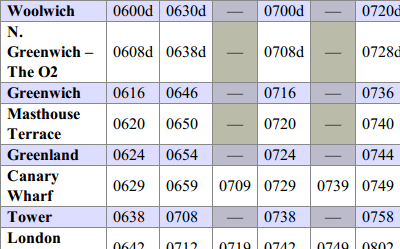 As a side-effect, I’ve made a more accessible HTML version of their PDF timetable. As I’ve probably mentioned before, the Thames Clippers river boat service serves a pier at the end of my street—I can see it from my window, in fact. It’s not the most convenient way to travel—it serves a limited number of destinations by definition—but it’s one of the most pleasant. I’ve been looking at their timetable data because there are a few interesting things I want to do with it. I’d like to display the time of the next departure as a widget on my computer screen, for example. I’d also like to have a way to check the times from my mobile phone. I did a bit of a feasibility study, and settled on using pdftotext to extract the tables. With the -layout option, it lines up the data more or less as it appears on the page. I also wrote a reusable library to handle reconstructing the tabular text back into columns. It’s done in HTML5 with CSS3. If you’re using a rubbish browser, it should still look OK, but it won’t have the nice zebra stripes, for example. I’ve put the code used to generate it on Github, along with a brief explanation of how to use it. I fully expect someone to take umbrage. No good deed goes unpunished, and all that.